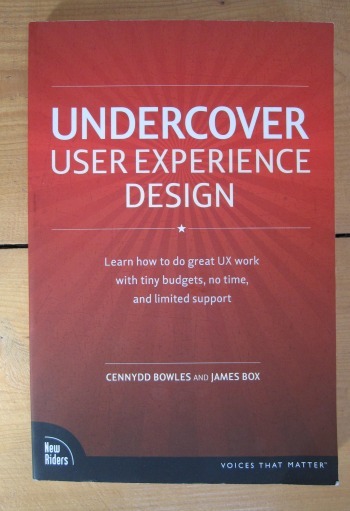 This week I was reading Undercover User Experience Design by Cennydd Bowles and James Box. Due to the collaborative nature of UX Design I am not sure this is quite the right title for this book, especially as much of their advice is about how to get people on board - that’s not very undercover. However this is very much the book I wish I had had when I was first getting into UX Design and trying to work out how to put my knowledge to use so that I could create a portfolio, which would get me employed. It is a little out of date, but then the tech industry moves fast, so although there is a good list of resources at the end of each chapter, I noticed some newer books and programmes were missing. The same goes for the process. Although the process is much the same, some of the technologies for creating deliverables or communicating with team members have moved on since the book was written. But do not let that put you off. The processes and advice in this book are all still valid and are a great place to start if you are just starting out or want to get the company thinking about the user experience. And there are lots of tips and advice which some of the books I have read assume you already know. They also acknowledge that this is not an easy task and so write accordingly, unlike some which write about the perfect process. So if you are just starting out, or trying to get user experience into a company, this book would be a very good starting point.